Guinea Pigs are small, sociable rodents that love chatting to other guinea pigs and even to humans! They communicate through chatter and other sounds. Typically guinea pigs are purchased as a first pet for children but it's advisable for parents to guide their children in the proper care of their pet in order to avoid certain stresses on the animal. Compared to mice and hamsters, the average Guinea Pig, if healthy, can live from 5 to 7 years. This is a long time when considering the lifespan of other pet rodents like hamsters and mice, both of which have average lifespan of 2 or 3 years! Diet is another factor that can affect your guinea pigs lifespan. A well balanced diet can add years onto your pet's life. Guinea pigs are grazers and eat things like grass, herbs, dandelions and groundsel. For instance, it is recommended not feeding your guinea pig 'Alfalfa Hay' because of its high calcium count which can cause some health issues. In place of Alfalfa Hay feed your guinea pig 'Timothy Hay' or 'Orchard Grass.' Guinea pigs also do not eat cereals, root vegetables or fruit. Vitamin C is an important supplement for your guinea pig. Guinea pig grass based pellets make an excellent source of vitamin C as do green leafy vegetables such as kale. Guinea pigs cannot produce vitamin C. If the above foods are not available, then they must be fed supplements of vitamin C in order for them to remain healthy. And please do not forget drinking water! Every living creature needs plenty of water in order to live and grow. There are a number of health conditions that can affect your guinea pig. 4) One condition facing your pet is called Bumble-foot.' This ailment is characterized by the ulceration of the feet. For guinea pigs living together, infectious diseases from viruses and bacteria sometime occurs. 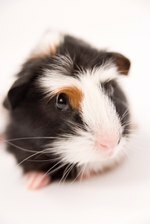 Infectious disease treatment can be tricky because guinea pigs are more sensitive to antibiotics than other pets. All these conditions are conditions that can be overcome. If you ignore these ailments you could very well end up with a medical emergency that may shorten your guinea pig's life! When the weather is warm it is important to check your Guinea pig for 'fly strike." Check around the fur at the guinea pigs rear end for urine stains or stuck droppings which can attract flies. Flies can lay eggs there, which is often fatal for the guinea pig! There is no real perfect way to care for your guinea pig but some considerations should be made. Poorly ventilated, damp or a dirty environment could make a healthy guinea pig ill. So keep the area clean and warm but keep them out of extreme heat or extreme cold. And lastly, as with many pets, keeping your guinea pig less stressed adds to their lifespan. Always be gentle and quiet around your guinea pig and never shout at or punish them. If they become nervous or scared they may display odd behavior like constantly hiding, cage bar chewing, over grooming, sitting hunched, immobility, or repeated enclosure circling. If this happens seek advice from an expert or contact your VET.